There are a lot of "Autism Biographies" around these days and they mostly follow the same patterns; Childhood difficulties, school bullying, addiction to "alone-time", workplace bullying and finally the discovery of autism and acceptance of one's place in the world. This story is quite different. This is a story about someone who didn't struggle quite so hard Autism plays a part in this story but it doesn't have the starring role. This time, the star is Rachael, not her diagnosis. It's definitely about a life well-lived. Of course, there are plenty of moments throughout this book where it's clear that some of the qualities of Autism are affecting events for better or worse but for the most part, Rachael presents as a capable and occasionally "otherworldly" member of society. If you've ever read a book or seen a film with a lead character who is defined by their autism and thought; "that's a bit excessive. I'm not like that. Maybe I don't have Autism after all..." Then this is the book for you. It demonstrates how perfectly the traits of autism can hide in individuals, particularly in females on the spectrum. The book is a breeze to read too because unlike some biographies, it reads more like a novel than a resume. Rachael tells the story with enough description for you to imagine yourself in the places she describes. I found this book particularly interesting because we were born in the same month of the same year- and only a state away. Having spent many of my childhood summers in Queensland, I found many of the Australian cultural references very familiar. As the story unfolds we follow Rachael overseas and into a nunnery - and it's a fascinating insight into how well the routine of these places fits with Asperger's syndrome. In the later chapters, autism begins to play a much bigger role but I don't want to spoil anything- you can read it for yourself. This book is a great read , particularly for mothers and daughters on the autism spectrum and for those interested in the way autism presents in females. It's well worth reading and highly recommended. 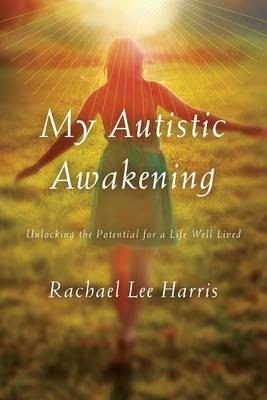 My Autistic Awakening: Unlocking the Potential for a Life Well Lived by Rachael Lee Harris is published by Rowman & Littlefield and is available on Amazon in Kindle and Hardcover versions. It's also available as an eBook on Google Play. Rachael Lee Harris is now a psychotherapist who is highly recommended by top Asperger's Syndrome Psychologist Dr . Tony Attwood, You can visit her web page here and her facebook page here. I have been seeing a wonderful Aspie woman for about a month now. She is just amazing and I have been enjoying our time together immensely. She hasn't told me she has Asperger's, but when we first went out I googled her as we had met on-line and learned she is somewhat active in the Autism community. I have wanted to talk to her about it, but want her to share this with me instead of me asking her about it. It is important to me that she choose to tell me. Had I not googled her I most likely would not have picked up on it. However, there is one area that I have noticed is most likely related to the Asperger's. When we first met we were together for over a couple of hours and found we had a lot in common. It was if she were mentally checking off a checklist and after a while she initiated asking for our next date (although now I wonder if it was a date). We spent over 5 hours together the second date and had a fabulous time. The time went by so quickly and I know she thought the same as she made an observation about how long it had been and she just seemed so surprised we had spent that much time together. On this date there were at least two occasions that she pulled abruptly away from me and I am quite certain she had wanted to physically touch or maybe even kiss me. After this we would text each other intermittently and I began to text more and ask her to do more things. This is when things changed. I was and am still certain she really enjoyed her time with me and had some romantic interest. I had initially said on-line I was only interested in friendship and since I was developing romantic feelings I told her of these feelings and asked if she was interested in dating. Surprisingly (and not so surprisingly) she said she was only interested in friendship. What I am wondering is did she only want friendship all the time and I misread the signals I thought I picked up on? Or, did I read them correctly and now she has withdrawn as she felt overwhelmed? It was a little uncomfortable for a few communications after this as I pushed a little bit too much because of how our two dates had gone so well. Then after reading some posts regarding AS-NT relationships I emailed her an apology telling her I know I pushed her too much and I am leaving the control of the communication and contact in her hands. She responded quickly and quite favorably to this and wants to resume the relationship as it was before, but as friends. I am fine with being just friends. I just am trying to understand if I am right that she had feelings for me and perhaps if I handle things differently she may feel that way again and we can proceed with slowly pursuing a relationship way down the road. I have read a lot of posts and this seems like a typical scenario for AS-NT relationships. I just don't want to lose her as seems the case in most of those posts. It is challenging trying to understand how to communicate with her, but she is so worth it. I just am not sure if she will see the same thing. Normally, I would be fine and move on if someone doesn't want to date, but I am just so certain she felt as I did and just withdrew because of feeling overwhelmed, pushed too much, etc. I am hoping you can give me a little feedback and perspective. I know there is no way of knowing what the future holds for us, but I don't want to give up on it if this is about allowing her some space, being patient, and learning how to more effectively communicate. Either way I am so fortunate to have met her and just want to keep her in my life whether it's as a friend or more. I almost lost her and want to do what I can to prevent that from happening again. If we are not going to be together I want it to be because we are not right for each not that the circumstances were too much for her to find out if we are a good match. I'm so glad to learn about this book! My aspie daughter is wanting to read more about Aspergers. I'm now trying to find age-appropriate books for aspie teens. Thanks for the great review! In answer to anonymous - I am a high functioning woman and it's my guess based on what you have said that no, she isn't interested in you like that. I had a lot of problems with male friends thinking the same things. I am very enthusuastic with my friends. There is actually a psychological "thing" called male perspective bias. This means that men are more likely in general to read friendly signals as sexual receptivness. You can google it to find out more. I think, knowing myself, it's probably much more likely for guys to think this with aspie women as, if they are anything like me and your friend, we can be very intense and tactile. But we are also honest. Just tell her you like her and really need to know, so you know where you stand. She won't lead you on (as maybe some non-aspie women would). I have had many male friends in my life and many of them did fall in love with me (sounds very big headed I know but I'm not going to help you by being modest) but the vast majority are all still friends 20 years on; all married with kids so we sorted it out in the end and remained great friends. But don't forget anyone can change their mind. Just tell her to let you know if she does. In answer to anonymous - I am a high functioning woman and it's my guess based on what you have said that no, she isn't interested in you like that. I had a lot of problems with male friends thinking the same things. I am very enthusiastic with my friends. There is actually a psychological "thing" called male perspective bias. This means that men are more likely in general to read friendly signals as sexual receptivity. You can google it to find out more. I think, knowing myself, it's probably much more likely for guys to think this with aspie women as, if they are anything like me and your friend, we can be very intense and tactile. Fascinating and heartwarming to read your blog. I am 30 year old female in the throes of ASD assessment in the UK. In the pretext for this article you say that there are many autism biographies that follow a similar pattern. I strongly relate to that pattern and wondered if you could recommend one to read first? Or, simply one(s) that you recommend? I look for audiobooks whenever I can so if there's one with audio then even better! I don't mind if it's a male or female story.